The basic membership is free of charge. 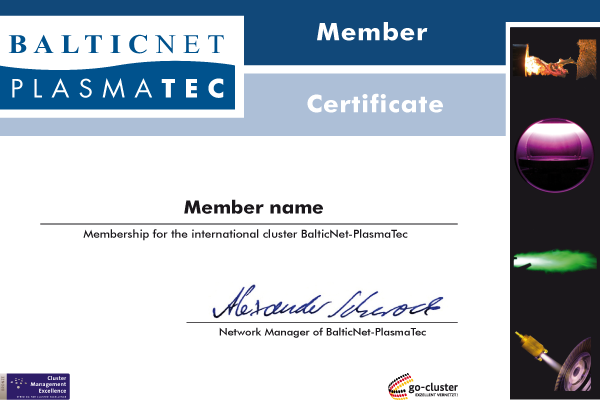 How be become a member of BalticNet-PlasmaTec? Please just fill in the request of membership („Become a member“ button) and send it to us. We will forward your request to our executive board and we will inform you about the decision. The basic membership is free of charge, but if you would like to join our Working Groups there will be fees. Please contact us to get more information about our working group and fees. Organisation and management of professional events, fairs, workshops, delegation journeys etc. Member presentation during events, fairs, workshops, delegation journeys etc.